The tiny town of Gásadalur is situated on an impossibly green basalt plateau overlooking the North Atlantic, on the island of Vágar. It’s part of the Faroe Islands, one of the least visited places on earth, despite its incredible beauty. Although many people have seen photographs of this picturesque village and its dramatic waterfall, only a very few are lucky enough to have been there — in fact, as of 2012, just 18 people lived in Gásadalur. And until 2004, when a tunnel was blasted through the island’s solid rock, the only way to reach Gásadalur was by climbing a strenuous trail over the rocky crags — some as high as 2000 feet. The island of Vágar, where the village of Gásadalur is located, is one of 18 tiny islands just about centrally located between Scotland, Iceland, and Norway, in the middle of the North Atlantic. These are the Faroe Islands — a self-governing region technically considered to be part of Denmark, and one of the oddest locations on the globe. Despite their extreme northern location, the Faroe Islands enjoy Gulf Stream currents and a more temperate climate than their neighbors in Iceland. The islands are home to millions of seabirds, and it’s their guano that keeps the islands blanketed in soft, springy green. The residents, probably as a result of their isolated location, have continued to speak their own Faroese language first, and Danish or English second. They maintain millennium-old traditions, including roofing their homes with the green turf that grows everywhere. It’s a fairly common sight to see someone mowing the roof of a home. There’s no place in the Faroe Islands that’s more than 3 miles from the North Atlantic — so clearly, most Faroese support themselves by fishing. And despite protests from modern environmental groups like Greenpeace, non-endangered pilot whales are still a major source of food and supplies for the Faroe Islanders. At the same time, villagers will tell you they learned their English from watching MTV. And even in this isolated corner of the world, cell phones are common and reception is generally reliable. 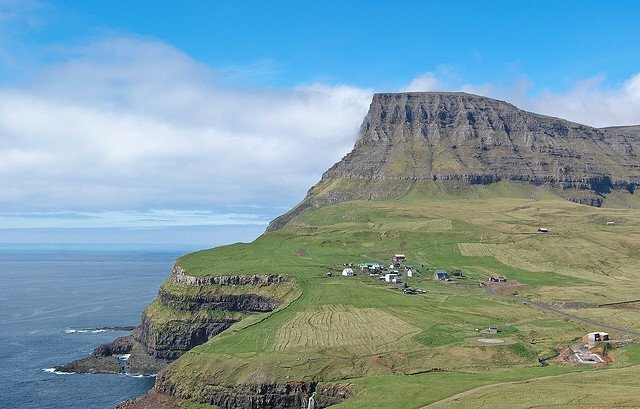 There is an international airport on the island of Vágar as well, making the Faroe Islands perfectly accessible to tourists who want to experience the immense volcanic mountains and pristine waterfalls of this astonishing landscape.